Melatonin contributes to the reduction of time taken to fall asleep and to the alleviation of subjective feelings of jet lag. The long-acting tablet does not break immediately, but rather ensures melatonin intake in a longer period of time. Tablet can be dissolved in the mouth or swallowed with liquid. *) The desired effect can be achieved by taking 1 mg of melatonin just before bedtime. **)The desired effect can be achieved by taking at least 0,5 mg before bedtime on the first travel day and then continue afterwards for a couple of days after arriving at the destination. Melatonin is a hormone found naturally in the body and it is secreted from the pineal gland in the brain. Melatonin is linked to the sleep-wake cycle and the amount of daylight affects the secretion of melatonin. During night and winter time it is secreted the most and this secretion is individual- as well as age-related. In small children, melatonin secretes abundantly, but with ageing melatonin production decreases as well as when using a lot of alcohol or when suffering from stress. Melatosell® Long supplement helps nutritionally to replace the body’s decreased melatonin levels. Melatonin helps to shorten the time getting to sleep because it prepares the body for sleep by decreasing body temperature and alertness. Melatonin does not affect sleep structure itself and does not cause tiredness in the morning. Melatonin supplement can be used when suffering from jet lag. It can improve certain symptoms of jet lag such as alertness and movement coordination as well as daytime sleepiness and tiredness. Melatonin returns the body’s own normal day rhythm. 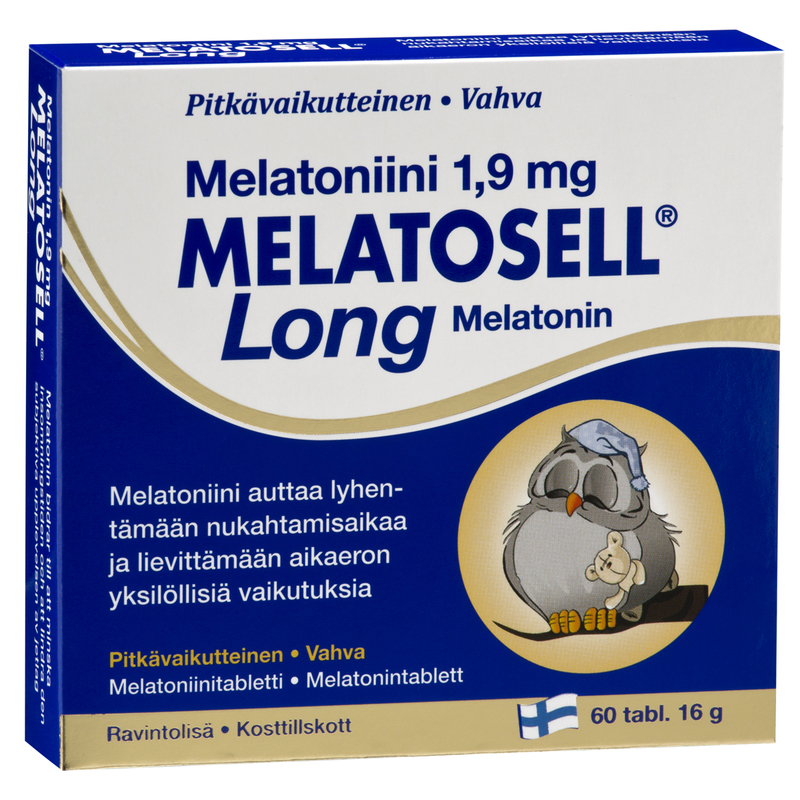 Melatosell® Long contains 1.9 mg melatonin / tablet. The long-acting tablet does not break immediately as it comes into contact with digestive fluids, but the tablet forms a gel-like mass from which the melatonin is released gradually in the gastrointestinal tract. Thus, the effect of melatonin lasts longer. Not recommended during pregnancy or breastfeeding. Not recommend to be used with sleeping medication.